This artist's concept shows the planet catalogued as 2003UB313 at the lonely outer fringes of our solar system. This artist's concept shows the planet catalogued as 2003UB313 at the lonely outer fringes of our solar system in this space wallpaper. 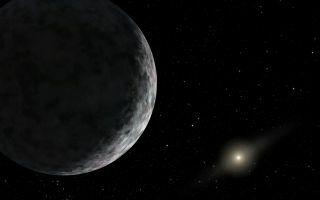 The planet was discovered by the Samuel Oschin Telescope at the Palomar Observatory near San Diego, Calif., on Jan. 8, 2005.